What pushes a teenager from the toughest sink estate in East London to join The Met? "Cracking read easy to follow full of action couldn't put it down..."
"If you haven't read this book then you don't know what your missing, couldn't put it down once I had started it." "Absolutely brilliant lots of twists and turns." 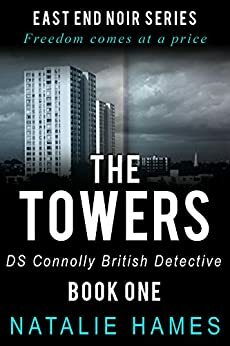 "Found all 3 of D.S.Connolly by chance but boy am I glad I did ...read them you won't be sorry"
"From the very first page onward I was hooked and could not drag myself away..."
"Another cracking read from Natalie Hames"
Not a totally bad read, but also not gripping. Easy to see where the writer was going from the beginning. Not enough guessing. 4.0 out of 5 starsCan you make a difference? Can you make a difference? Matthew knows that his mother had no choice but this place is awful and the gangs will stop at nothing to muscle their way in. Matt is trying to keep his brother Mark out of trouble and he worries that he is going to get in with the wrong crowd. Mark tries to keep his nose clean and he needs the extra money to help his mother pay the gangs. But he never signed on to get involved with drugs but he doesn't see a way out now. Can Matt get his revenge, they killed his dog and he will do anything to bring them down so he is happy to help the police with their case but he needs to know that his brother Mark will be able to walk away? Will Mark take this chance and walk away to start a new life with his girlfriend before they come after him? Can Matt move on and make a difference to others? The Towers by DS Connolly was a decent enough read. The first thing I feel I must critique is the East End Noir Series sub title, it did not feel like a Noir title at all. Once I began to delve into the book I did enjoy it, it wasn't what I was expecting but it was still enjoyable enough to finish reading to the end. I like the characters and the overall plot of the story, it was a bit slow moving for my taste but as a whole it was a decent read. I gave up 26 Per cent.through. I enjoy British authors, but this is too depressing and rather predictable. I was disappointed.